Porcelain restoration isn’t magic, but it’s pretty close! Here’s everything you need to know. I have a broken piece of porcelain. What do I do now? Save every piece you can find. DO NOT try to glue the pieces back together if you intend to have the item restored. We will only have to take it apart and reglue it. This adds to the cost of repair. You can bring the item into our shop, or you can ship it to us. Upon receipt, we will give you an estimate for restoration. You can send us pictures via email if you want a ballpark estimate, but know it is a ballpark estimate only. We cannot give accurate estimates from emails or phone descriptions without having the piece in hand. Should you decide to have the item restored, we will provide the time frame for completion, and request a 50% deposit before work begins. Can I get a ballpark estimate before shipping my piece to you? Many people would like to know an estimate for repair before they incur shipping charges for an item that may not be worth repairing. Feel free to e-mail or call us (352-245-8862) with questions of this nature, but as stated in the previous section, there is no way to give an accurate estimate without having the item in hand. We can issue a ballpark guess based on what is described to us, but we will not be held to that price should there be more to the restoration than was described to us. As a general rule, a simple repair starts at $50. Of course, simple is a very relative term. Every repair has its difficulties, whether it be an odd texture, or intricate pattern, or a difficult color to match. Some repairs may be less: small chips, glue only jobs, etc. But if you don’t want to spend at least $50, it’s probably best not to send it. See our instructions for packing your piece in the following section. How do I pack my fragile item in preparation to ship to you? When shipping a fragile item, there are a few things to consider about packing. If you have the original box, by all means, use it. Sometimes, like in the case of some Lladro figurines, they are held in place by the base and head. If a figurine has lost its head, then obviously more care will need to be taken, because the design of the original box is no longer useful. Still pack it in its original box, but take care that it does not move around. In all cases, wrap each broken piece separately, and DOUBLE BOX your item. DO NOT just wrap something in bubblewrap, throw it in a box with packing peanuts and expect it to arrive in the same condition as when you sent it. We see this quite often and the results are not pretty. To double box an item means to put the box that you carefully packed your broken pieces in, and put it into a larger box (at least 2″ larger on each side) with packing peanuts. Some people prefer to take their item to a pack and ship type establishment for this task. Whatever you choose, be sure to include your name, address, and phone number inside the box, and insure the item. What happens when you receive my piece? We will assess the damage and provide an estimate for restoration. You will then decide whether to repair the piece or not. If you decide to proceed with restoration, we require a 50% deposit before work begins. The balance, plus shipping and handling, is due upon completion. Your item will be shipped to you upon receipt of the balance. If you decide not to restore your item and want it returned to you, shipping and handling charges will apply. These charges are to be paid before the item is returned to you. How much do you charge for shipping and handling? Very often when people hear the phrase shipping and handling, they think only freight charges. That’s only part of the cost. On top of freight charges, we have to consider packing material charges, weekly pickup charges from the freight carrier, and the most costly thing, the time it takes to pack an item to stand the rigors of today’s conveyor belt shipping hubs. Taking into account all of those things, we’ve come to a basic fee of $20 for the average box. Extremely fragile items that take more time to pack, oversized boxes, or high insurance items, will be charged accordingly. We specialize in porcelain, ceramics, and similar materials. Some of the brands we restore are Lladro, Hummel, Roseville, Weller and like American pottery, Meissen, Boehm, Cybis, Walt Disney Classics, Armani, and similar art objects. We are often asked if we can do anything with glass. Absolutely! If glass is broken, we can glue it back together with a specialty glue just for that purpose. We cannot hide the break, but it will be less obvious once it is glued together. We are experts at Swarovski Crystal repair. We are listed by the Lladro Society as a qualified restoration company for Lladro figurines and by the Hummel Society for the restoration of Hummel figurines. We do not repair china or dinnerware. Try Replacements LTD to replace the piece. What exactly is a restoration? Complete restoration: A repair that is invisible to the naked eye and under blacklight. Glue only: No attempt is made to disguise the break or damage. The pieces are glued back together, that is all. Glue and touch-up: Same as above, but small chips will be colored so that they are less noticeable. The chips may be filled or unfilled, depending on the client’s wishes. We do not repair or restore any kind of dinnerware. Try Replacements LTD if you need a piece of china replaced. I’ve found them to be helpful folks, and they have quite an extensive inventory. We are located in Belleview, FL, which is just south of Ocala and approximately an hour north of Orlando. Click here for directions via MapQuest. Please note: if you are coming up Hwy 301 heading north, MapQuest, Google Maps, et al., will tell you to turn left at Babb Rd. You cannot make a left there (no left turn). 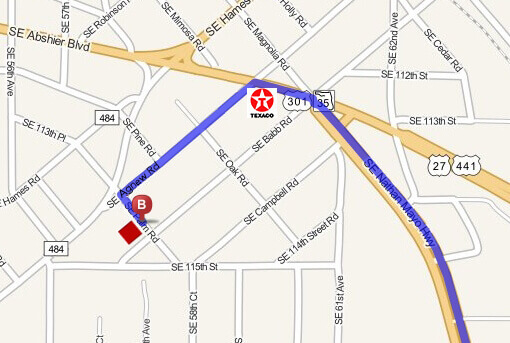 Go past Babb Rd., through the light, and then turn left at the Texaco Station on SE Agnew Rd. Take the second left on SE Agnew Rd., which is SE Palm Rd. We are on the right. See map insert. We are open for pickup and drop off by appointment only. Restoration is a very time sensitive process. Working with glues and glazes, we can’t just stop in the middle of the process, so we rely on our appointment system to set aside blocks of time to devote entirely to our in-person customer service. We understand things come up, traffic holds you up, and life in general just doesn’t get the memo about our well laid plans, but if you can’t make your appointment, please call to let us know so that we can adjust our shop schedule accordingly. Call 352-245-8862 to set up an appointment. What if there are missing pieces? Missing pieces are a common occurrence, and while it adds to the expense of the repair, it is by no means a reason to abandon hope of a complete restoration. Our talented artisans will recreate the missing part(s). How much will it cost and how long will it take? Cost is based on the extent of the damage and the time it will take to restore the item. It is not based on the intrinsic value of the piece. Because of this, sometimes the cost of restoration exceeds the actual monetary value of an item. We will tell you if this is the case. Sometimes sentimentality plays a part in one’s decision about whether to restore a piece. The final decision is yours. Shipping and handling charges apply to all returned items. The time involved in an item’s journey through the restoration process varies. This type of work is tedious and time consuming and often there is a backlog of work. Because of this backlog, it may take several months from the time we receive an item to the time it is returned to you. We will give you an estimate of our current time frame. Will I get an estimate? If you drop off your item, we will give you an estimate of time and cost at that time. If you ship your item to us, we will call with an estimate of repair and the current time frame for completion. A 50% deposit is required before any work begins. The balance plus shipping and handling will be due upon completion, and your item will be shipped upon receipt of your payment. Shipping and handling applies to all returned items, whether you choose to have them restored or not. How do I care for my restored piece? All pieces are thoroughly cleaned before restoration. Periodic dusting with a soft brush should be sufficient to keep your piece clean. Do not use abrasives or solvents. Do not display your piece in direct sunlight. Do you have any pieces for sale? Occasionally we do have restored pieces for purchase. To see what we have, click here. Weren’t you the Eric W. Idstrom Company? Yes, I apprenticed under Mr. Idstrom and worked as a full-time artisan with him until he retired in 1991. We then transitioned the company name to Leak Enterprises. The artisans are the same, and the high standards of workmanship set by Mr. Idstrom are still practiced. We’re the same company, only the name has changed.